Read I-STEP newsletter 4! - De website van projectistep! 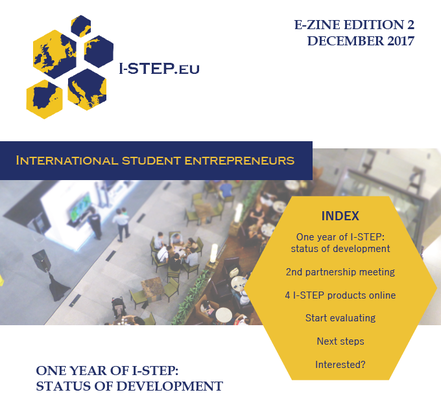 In about one month we will complete the I-STEP project in which we have been working on international student Entrepreneurship for two years. As a partnership we are very happy to look back at a successful project with great results and impact. Read about the last parts of the project in this fourth and final I-STEP newsletter! There are just over 4 months left in the I-STEP project. In a few weeks we will organise the international I-STEP confrence in Lithuania. Read all about it in I-STEP newsletter 3! Join us at our I-STEP international conference! Are you a student, teacher, entrepreneur, interested in international entrepreneurship? 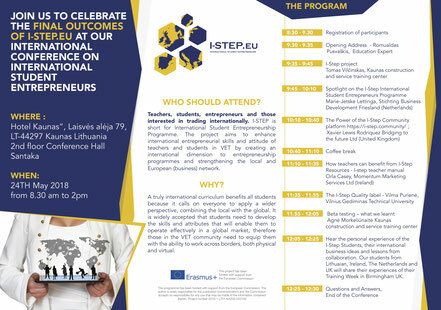 On the 24th of May we will organise the I-STEP international conference in Kaunas, Lithuania, to celebrate the final outcomes of our I-STEP project. Download the flyer for more information and join us on the 24th of May! LYIT students from the Department of Business Studies and Computer Science took part in a week long training programme on international entrepreneurship in Birmingham, UK. The I-STEP project is an EU Erasmus Plus programme which seeks to enhance the participation of the VET sector in international entrepreneurship teaching. 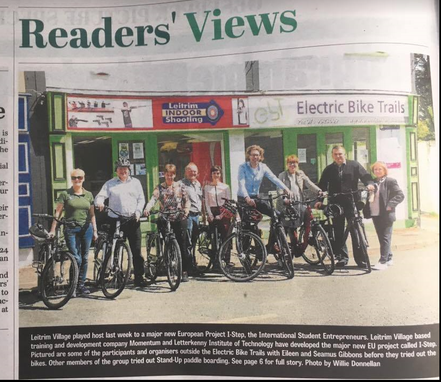 Letterkenny Institute of Technology has been developing this project along with partner organisations from Ireland, Lithuania, The Netherland and UK. Hosted by the UK partner, LYIT students pilot tested the I-STEP materials and platform and their feedback will be used to improve the programme before it goes fully live in June 2018. 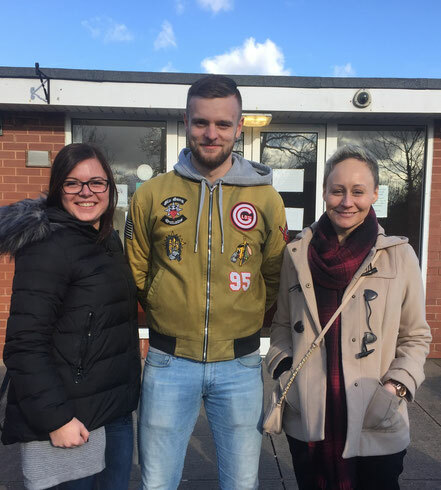 A key element of the week in Birmingham was the formation of international business teams whereby one student from each country came together to work on an international business idea. Padraig Gallagher, Project Leader from LYIT said, “The students’ business ideas were inventive and designed by them to fulfil a real identified need. I was impressed that we had a mix of products and services and I have to commend the students on their efforts of working together throughout the week. All of our students, Aisling Bonner, Chloe Johnston, Lee Hannigan and Melanie Doherty were tremendous ambassadors not only for Letterkenny Institute of Technology but also for our country in this international project”. Melanie Doherty, Year 1 Accounting student added, “We covered a lot of topics while developing our international business ideas during the week and one of the key things we all took away from it was the need to effectively communicate. Pitching the business idea at the end of the week was daunting but we were all very well prepared and I am delighted to be part of the winning team along with my ‘business partners’ Stein (Holland) and Carolyna (Lithuania). We will continue to work together via skype and email until we present our idea at final project conference in Lithuania in May. 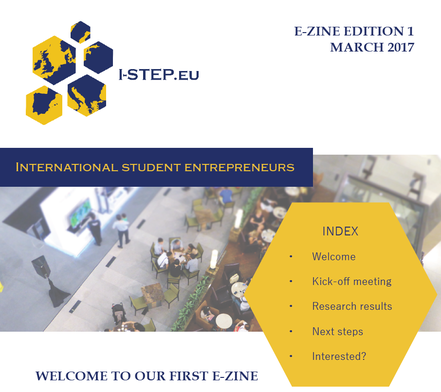 Read the second edition of our I-STEP e-zine! For the I-STEP consortium, 2017 has been a busy and exciting year. Read all about it in this second I-STEP newsletter! Leitrim Village based training and development company Momentum hosted the 2nd I-STEP partnership meeting. 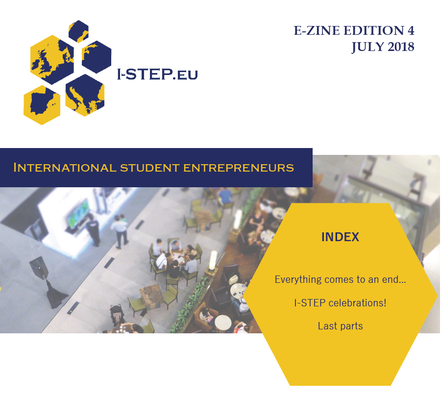 Through the I-STEP project, students will learn how international business works, collaborate with students of Entrepreneurial studies in Vocational Education and Training throughout Europe and create a new business model for internationalisation with their peers. 14 project partners came together for a two day meeting. As part of the programme, presentations were made by 13 year old young entrepreneur Zack Dolan, from Carrigallen Vocational School who won the Innovation Prize in the Junior category, at the Student Enterprise Programme National Finals and Geraldine Reynolds of the Local Enterprise Office. The partners also took part in outdoor activities where they could choose between surfing and cycling with electric bikes. In the coming months partners will develop and finalise the International Student Programme, the platform and the quality label in order to help VET colleges add an international component to their entrepreneurship programmes. Developing international entrepreneurship programmes in VET; that is what I-STEP is about. Read about recent I-STEP development and progress in our first I-STEP newsletter! Download the I-STEP newsletter here! 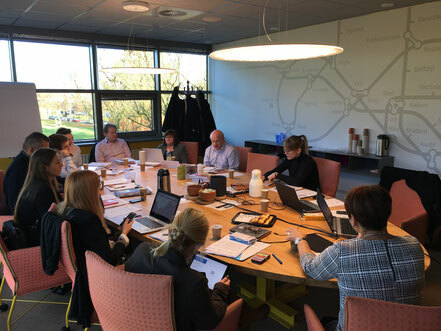 On the 16th and 17th of November 2016 project I-STEP kicked off at the premises of Noorderpoort College in Groningen, the Netherlands. The meeting brought together the consortium for the first time, in an effort do discuss and clarify the project objectives, agree on the project plan and timetable and to confirm the understanding of partners' role and responsibilities in the project. In the coming two years the focus will be on the development of the International Student Entrepreneurship Programme (I-STEP) that will help VET colleges to add an international component to their entrepreneurship education. The teaching material will be developed by a strong consortium of partners with experience in entrepreneurship and internationalisation support, including two VET colleges, two HE universities, two incubators and a marketing and training expert. Participating countries in this project are Ireland, the United Kingdom, Lithuania and the Netherlands. Next meeting is planned on the 11th and 12th of May in Leitrim, Ireland.